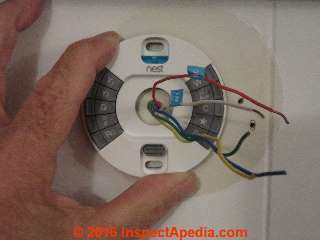 Detailed photographs and text describe how to how to install, set, troubleshoot & repair a Nest Learning Thermostat, beginning with removing the old wall thermostat, labeling its wires, preparing the wall for the new thermostat, then installing the Nest Thermostat and getting it working nicely. 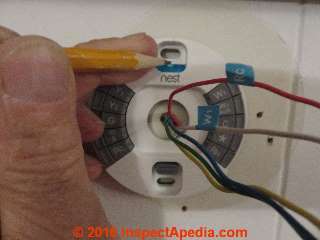 This article series provides detailed photographs and text describing how to how to install, make wiring connections, and then set-up a Nest Learning Thermostat, beginning with removing the old wall thermostat, labeling its wires, preparing the wall for the new thermostat, then installing the Nest Thermostat and getting it working nicely. Opening the box containing a Nest Learning Thermostat you'll find the thermostat itself as well as additional tools and parts that we'll list below. Look for and read the installation instructions provided by Nest as you'll find those 12 steps (listed, illustrated and explained below) simple to follow. Usually. Here we use a Nest 3 learning thermostat to illustrate how to install this control. But these Nest wiring instructions will work for any of the Nest thermostat line. 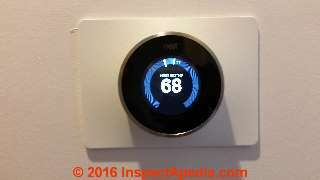 Here we expand on and illustrate the Nest thermostat installation instructions to include details that you may encounter and that aren't addressed by typical room thermostat installation guides. 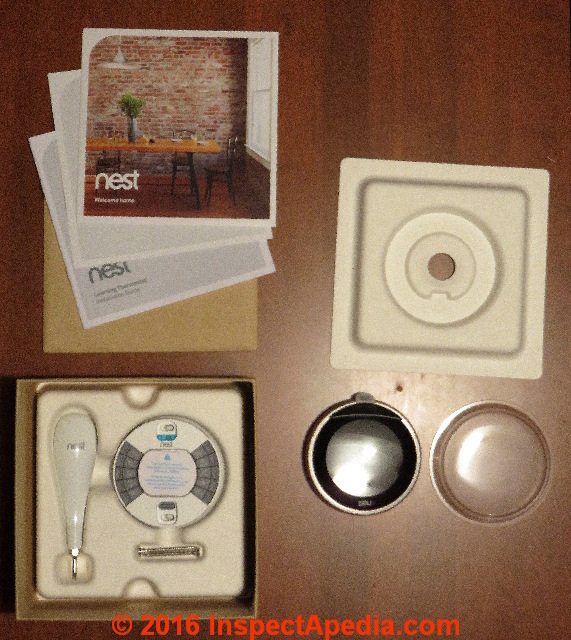 In our photo of what's in the Nest thermostat package you see, from clockwise at upper left: Nest installation instructions and other literature, a cover that's removed to give access to the Nest thermostat itself, the Nest learning thermostat and a clear plastic cover (removed) that prevented scratching, and still in the box, the Nest thermostat wall plate and a cute screwdriver provided by the manufacturer. 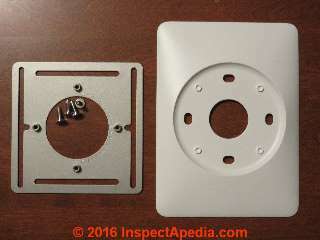 In the bottom of this box you'll find an accessory trim plate that might be needed to cover ugly wall conditions where the old thermostat was installed, and you'll see some thermostat mounting screws. 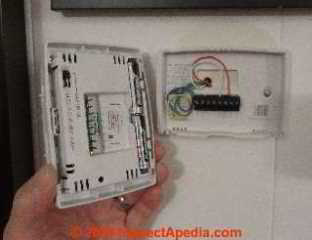 You'll also use that trim plate if in your building the thermostat wires are routed through an electrical box. Switch off Power - turn off electrical power to the heating or cooling equipment that the Nest thermostat is going to control. Nest points out that this helps prevent tripping a circuit breaker or blowing a fuse on your existing equipment. Typically the actual equipment you're controlling, an air conditioner or heating system operates on 120Volts or 120VAC, while the thermostat itself operates on a lower voltage level: 24 VAC. The thermostat is itself ultimately a simple "on-off" switch that will turn your air conditioner or heating system on or off in response to room temperature as it compares with the "Set" temperature you've specified on the thermostat. It's also safer to always work with electrical equipment turned off, even if shock hazards seem pretty remote. 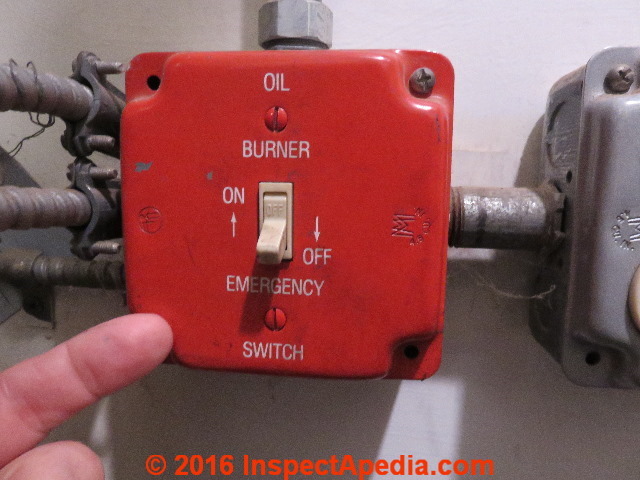 In our photo above, in the boiler room we've switched off the service switch to the heating boiler. In most heating system installations turning off this switch will also turn off power to the low-voltage transformer that actually supplies 24VAC to the wall thermostat. 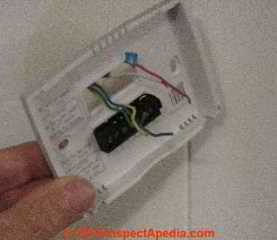 Remove cover - remove the cover from the existing wall thermostat. 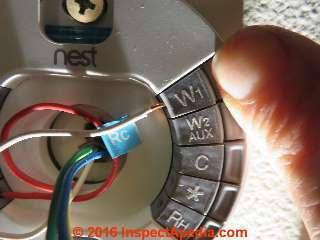 You'll need to do this to see the wires and to label, then disconnect them from the old thermostat in preparation for its removal. Usually the thermostat cover snaps right off but a few older thermostats may sport a small screw to be removed. Watch out: stop and look at our photo above: see that the temperature (70F) is shown in the display. So we know that power has not been turned off to this system. If power were off the display should be blank - but not always: some thermostats may use an internal battery that will continue to show the display even when power is OFF. Usually an error message will also be in the display. 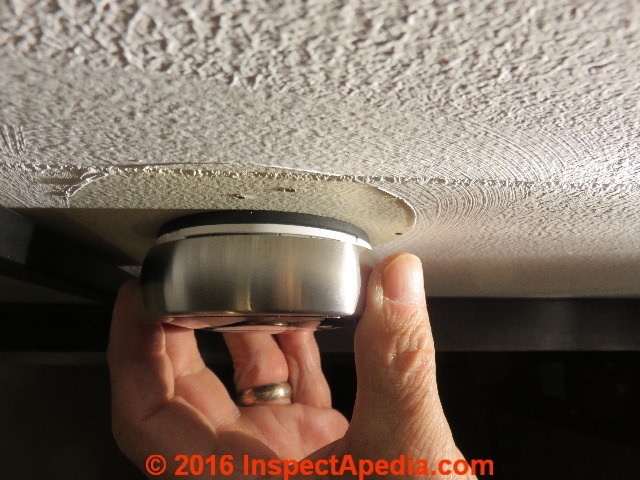 For the old thermostat that we'll remove in our example, we remove the cover by hooking a thumb or finger under the bottom edge of the thermostat other fingers on the upper edge of the thermostat. Then our fingers pull the thermostat bottom cover up and away from the wall. Why go to so much trouble? 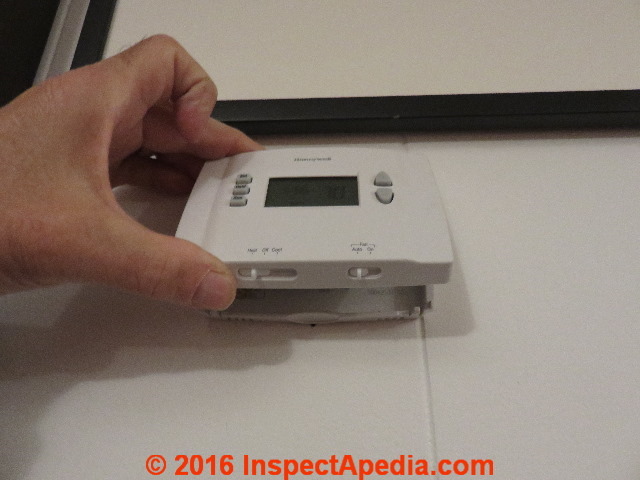 Well some thermostats are mounted to the wall by simple screws fastened into nothing more than drywall. We don't want to rip the whole thermostat away from the wall if we can help it as that would damage the wall and leave a mess. Below I've removed the existing wall thermostat from its base. Next we'll check to be sure we're working with a 24VAC thermostat not a line voltage unit. 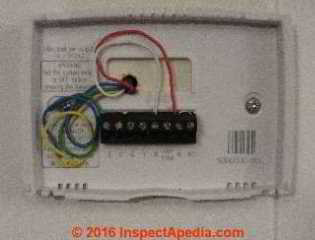 Check your system - check the labeling on the existing thermostat and check its wiring for evidence that yours is a line-voltage or 120VAC or 204VAC thermostat. First: note the small diameter wires in the device. 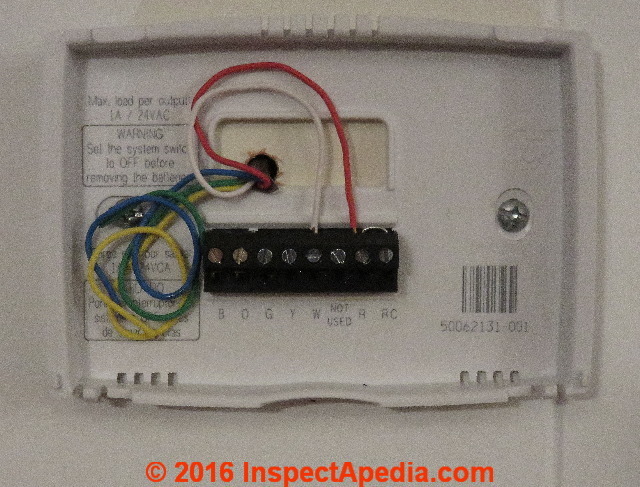 Second: in the upper left corner of the wall plate we see labeling that indicates 1A/24VAC. Great! This heating system will accept a Nest learning thermostat. 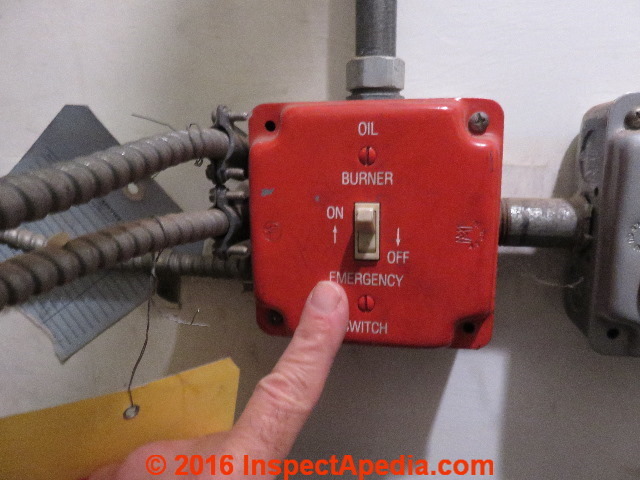 You might also notice that only two wires, a red and a white wire were in use at the old thermostat. This is the most-simple situation. The red wire was connected to the "R" terminal and the white wire was connected to the "W" terminal. Wiring up this Nest thermostat is going to be a snap. Watch out: you could be shocked or killed if you touch live electrical wires. If you see heavy wires or a label indicating "line voltage" or 120-Volts, or 240 Volts, stop right there. First double check that electrical power has been turned off. 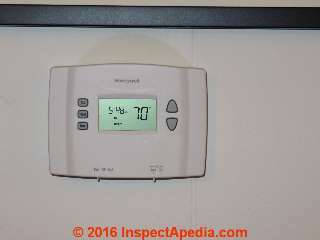 If the thermostat display is now blank and if turning the thermostat setting up or down does not cause your air conditioner or heating system to do anything then probably power is off. If you cannot tell if you've got low voltage (thin wires, 24VAC thermostat wires) or high-voltage (120 VAC or 240VAC thick electric wires with large twist-on connectors or "wire nuts") then stop and contact Nest support or hire a licensed electrician to help you out. If your heat is provided by electric baseboards, chances are your thermostat is a line-voltage 120VAC or 240 VAC thermostat. Stop there. Watch out: never connect a Nest thermostat to high voltage (120V or 240V) electrical wires. If you do, in addition to the safety warnings already given, you'll destroy the thermostat. At REPAIR AUTOMATIC OUTDOOR LIGHT FIXTURE we illustrate how to use a low-cost neon-tester to double check that electrical wires are not "live". 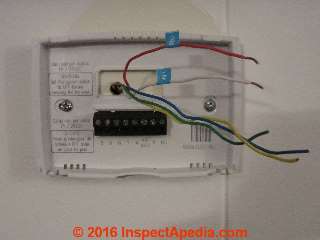 Remove jumper wires - if you see short jumper wires between connectors in the old thermostat you can remove them or just ignore them since they'll stay with the old thermostat when you remove it. Nest explains and we agree that you can simplify the electrical wiring by tossing un-needed jumper wires; for example, a wire labeled as "R" (usually this is a red wire) can be connected to either a terminal marked RC (red wire for cooling) or RH (red wire for heating). Label wires - Nest gives you some nice little stickers that you can wrap around each of the in-use thermostat wires to avoid any confusion when hooking them up to the Nest thermostat later. Watch out: it's smart to attach labels before you disconnect any wires. That way when the baby cries or the dog pees on the floor in the middle of your Nest thermostat installation project the distraction won't lead to a wrong-wire connection later. Sometimes the actual-use of wires doesn't match the wire color code. Compare the wire colors against the names of the terminals where the wires are connected on the old thermostat. 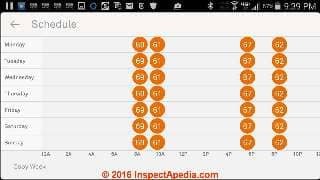 At THERMOSTAT WIRE CONNECTIONS - separate article - we review the standard thermostat wiring color codes and connections. 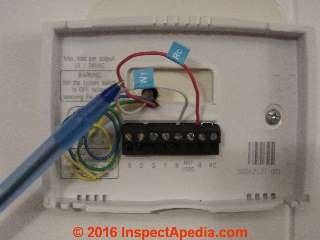 Disconnect wires & remove base - our photo above shows that we labeled only two wires: the red and the white wire, since no other wires at this wall location were connected to anything in the old thermostat. We've straightened out all of the wires so that it'll be easy to remove the old thermostat base plate. 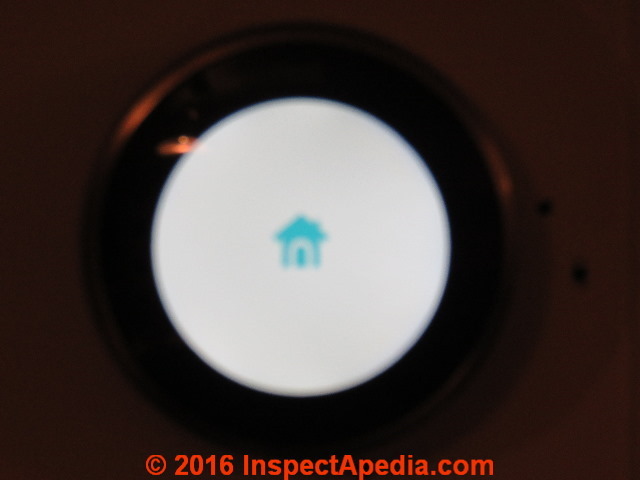 Below are photos for the next Nest learning thermostat installation step: marking where the Nest thermostat base plate mounting screws will go. Mark where screws will go - Above you'll see I'm placing the new Nest 3 Learning Thermostat base plate against the wall: I route the wires through the opening in the center of the base plate, and then using Nest's built-in level, I hold the thermostat level on the wall : the bubble is between the two black lines marked on the blue fluid-filled tube. Above I'm ready to mark the screw locations that will mount the thermostat on the wall. I'm fastening this thermostat to a wall built of drywall covered by wood paneling. The screws will give a nice firm purchase thanks to the paneling. I make my marks in the center of the oblong screw opening. That will allow slight fine-tuning to get the thermostat base plate truly level on the wall. This thermostat will work properly even if it is out of level, as it uses a modern thermistor type temperature sensor. 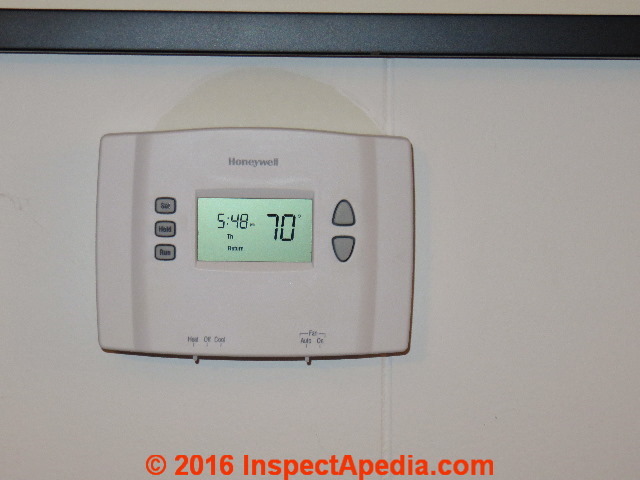 Some older thermostats would actually be inaccurate if not kept level on the wall. So why do we care? Well for one thing your new beautiful Nest 3 Thermostat display will look crummy if the temperature or text displays are visibly slanted on the wall. And if you're mounting the thermostat to plain drywall, trying to fix an out-of-level thermostat by moving a screw over 1/8" drywall is going to turn into a nasty project - I'll demonstrate that in a separate article. Watch out: if the hole in the wall through which your thermostat wires emerge is anything but quite snug around the thermostat wires, seal it with caulk, chewing gum, or something before you mount the new thermostat base. Otherwise air currents and leaks through the wall cavity and out at the wiring opening can fool your thermostat into misreading the actual temperature in the room where it's mounted. 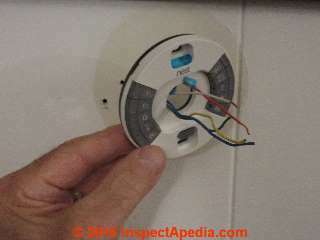 I'll demonstrate sealing a big hole in the wall around thermostat wires in a separate article. If your thermostat wires protrude through an opening like the one shown above, be sure to see how to seal that opening best at THERMOSTAT WIRING OPENING SEAL. Don't just use a thermostat base plate to "cover" over a messy wall like the one shown above. Air leaks through those openings can still foul up the accuracy of the room thermostat. 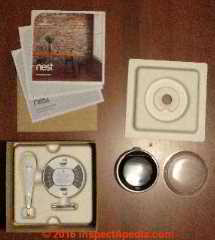 Below we continue with the attachment of the Nest thermostat base. 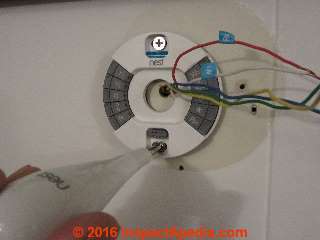 Attach the Nest base - Nest includes some nice double-helix coarse-thread screws that are suitable for attaching the Nest thermostat base to the wall. Watch out: When preparing your thermostat wires and before you start screwing the new thermostat mounting plate to the wall, if extra wire slack permits, be sure that you've pushed a loop of thermostat wire away from the wall surface inside the wall cavity. This extra space and loose thermostat wires inside the wall cavity will reduce the chances that you drive a sharp-pointed thermostat base mounting screw through the thermostat wires, damaging them or even breaking or shorting the wires. 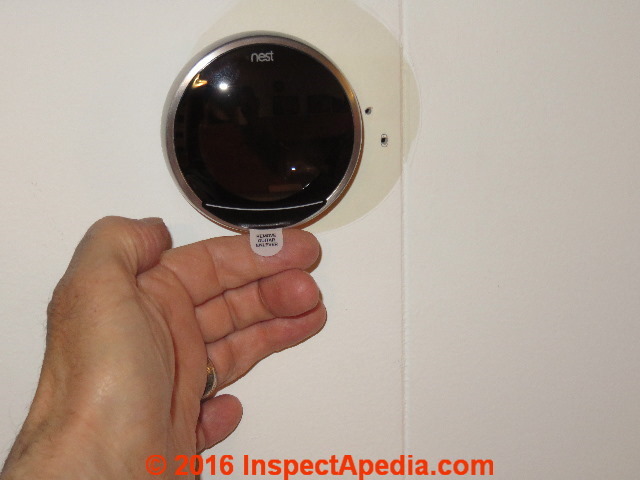 Watch out: helping my brother-in-law David install a Nest in his Chicago home we were using the metal electrical box plate and the trim plate shown below to mount David's Nest thermostat. 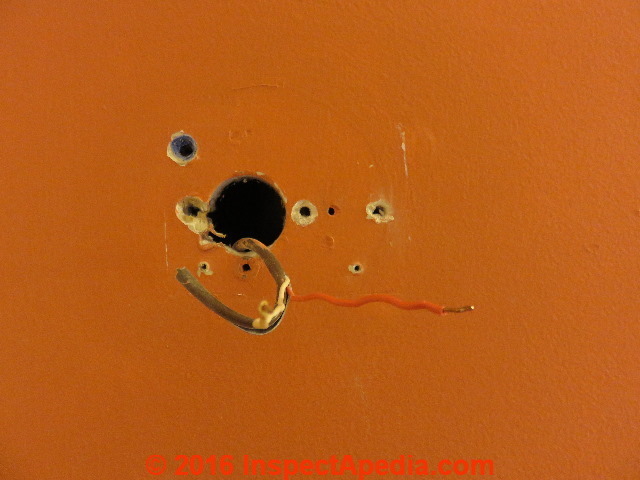 Using my fat stubby fingers and fumbling to start one of the screws, I managed to drop a screw through a large wiring opening in the wall and down inside the wall cavity. As I heard the "clink" of the screw hitting the bottom of the wall cavity about five feet below, I felt like a real dope. David didn't say anything but he did have a sort of smirk on his face. So there's another reason to seal up that big wiring hole in the wall before attaching the thermostat base plate. Happily the finished Nest thermostat installation (second photo below) looked pretty good anyway. As one of my bosses once said, "This young man never makes the same mistake twice, but apparently he intends to make them all, once." Below we continue by attaching the white wire to the W1 terminal on the Nest thermostat base. Connect wires - Above I'm pushing the end of the white wire into the W1 terminal on the Nest thermostat base. Push in the small button to the right of the wiring terminal for easiest wire insertion. Watch out: as I illustrate below: if the thermostat wire ends are bent and crooked they may not make a nice reliable connection on the thermostat base. Use pliers to straighten the wire end or if it's nicked and nasty, provided you've got enough extra wire length, just snip off the old end and strip back about 1/4" of insulation to make a new wire end for insertion. Above: straightening out kinked thermostat wire before trying to connect it. 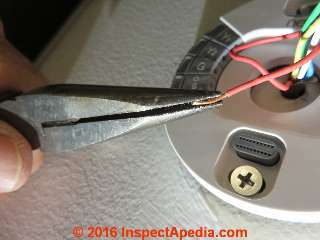 Watch out: to align the wiring connection plug with care before pushing the display into position. Watch out: also to remember to remove the protective stick-on tab over the sensor on your Nest Thermostat. Otherwise it won't be able to see very well. [Below] When the Nest thermostat is successfully mounted to the Nest wall plate, the display will be black as we show below, as we've not yet turned on power to the Nest thermostat. 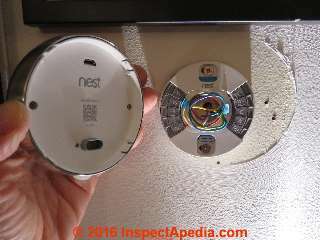 Above is the pull-off tab to be removed from the Nest's room sensor. Switch power back on - turn on the same heating or air conditioning main power switch that we turned-off at Step 1. Above: this is what you'll see when the Nest thermostat is first powered-up: the screen lights and the icon appears as shown. Setup and Nest Account - [Text in process ] If you have not already done so, Nest's instructions with the Nest 3 instruct you to go to nest.com/account - or currently https://home.nest.com/ to create an account or to sign in to an existing account. 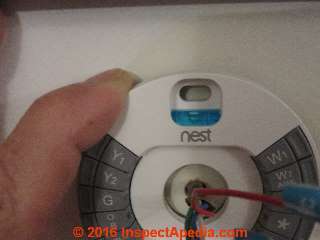 Your Nest learning thermostat will tell you what thermostat control wires it has found connected to itself. And it will ask you if you're a Nest-Professional installer. I say no. The Nest thermostat will let you know what type of equipment it thinks it's controlling. Below we're using a smartphone to check our Nest account and its ability to control a Nest 2 learning thermostat. With your nest account activated, by smartphone or from your computer you can both monitor what each Nest thermostat says is going on in your building and you can program the thermostat's set back time and temperature by day. "The Nest Learning Thermostat" is an electronic device that can control room temperatures and possibly other components connected to or installed as part of a home automation system. We have installed three of these in our test building and will report further on ease of installation, programming, and use as well as using and adjusting the Nest thermostat remotely from your cellphone, computer, or tablet. Nest learns your schedule, programs itself and can be controlled from your phone. 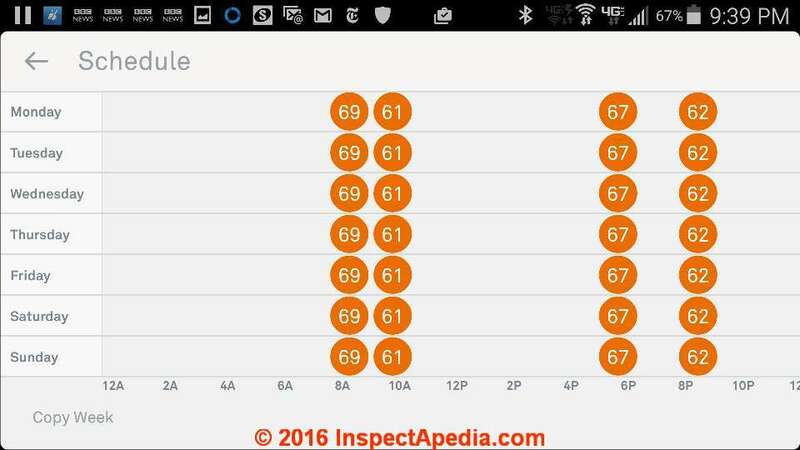 Teach it well and Nest can lower your heating and cooling bills up to 20%. The Nest® Learning Thermostat also communicates wirelessly with Nest's Protect® shown at left, the company's carbon monoxide detector & smoke detector released in 2013 (CO DETECTION OPTIONS). Really? : this smart thermostat is very appealing but in our OPINION it is a bit pricey at $250./ per thermostat plus $119 for concierge installation of one unit, more-so in buildings with multiple heating zones each of which requires control by an additional individual thermostat. The good news is that most consumers probably don't need to hire a concierge service to install the unit. 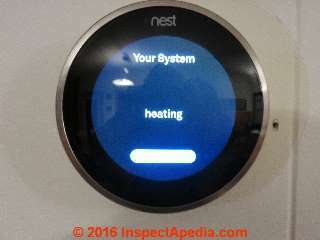 Photo above: the Nest Learning Thermostat in programming mode with a red display indicating a programmed temperature and time. Separately at NEST CAM INSTALLATION & USE we describe installing and using Nest cams (security cameras) or drop cams for both home security monitoring and for remote monitoring of a building for leaks, loss of heat, water or ice damage, or for intrusion or security issues. 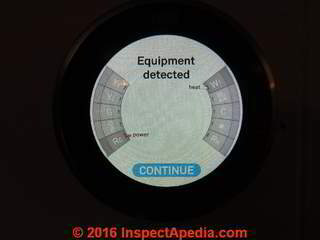 Continue reading at NEST THERMOSTAT SET-UP & PROGRAMMING, or select a topic from closely-related articles below, or see our complete INDEX to RELATED ARTICLES below. NEST THERMOSTAT INSTALLATION & WIRING at InspectApedia.com - online encyclopedia of building & environmental inspection, testing, diagnosis, repair, & problem prevention advice. 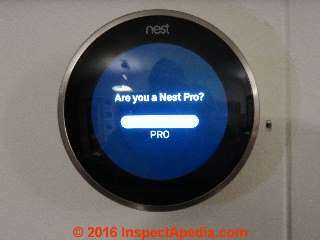 "The Nest Learning Thermostat", Nest Thermostat, 900 Hansen Way Palo Alto, CA 94304, Tel: 855-4MY-NEST, Email: info@nest.com, website http://www.nest.com/, retrieved 1/24/2013. This unique A-Z guide to central heating wiring systems provides a comprehensive reference manual for hundreds of items of heating and control equipment, making it an indispensable handbook for electricians and installers across the country. The book provides comprehensive coverage of wiring and technical specifications, and now includes increased coverage of combination boilers, recently developed control features and SEDBUK (Seasonal Efficiency of Domestic Boilers in the UK) boilers ratings, where known. In addition to providing concise details of nearly 500 different boilers fuelled by electric, gas, oil and solid fuel, and over 400 programmers and time switches, this invaluable resource also features numerous easy-to-understand wiring diagrams with notes on all definitive systems. Brief component descriptions are provided, along with updated contact and website details for most major manufacturers. Principles of Steam Heating, $13.25 includes postage. Fuel oil & Oil Heat Magazine, 389 Passaic Ave., Fairfield, NJ 07004. Principles of Steam Heating, Dan Holohan, technical editor of Fuel Oil and Oil Heat magazine, 389 Passaic Ave., Fairfield, NJ 07004 ($12.+1.25 postage/handling).